is dedicated to the restoration of your antiques. We have a free hardware matching service. We find original replacement hardware for approximately 90% of requests. Tip: Please use your browsers Find command (control "f") to help locate what you are looking for. It's also available in your Edit pull down menu. 1.Do you have a printed catalog? 2.Do you have a newsletter or mailing list? 3.I have an antique dresser that is missing a pull. Can you match it for me? 4.How can I tell solid brass from brass plated steel hardware? 5.What is the difference between a rim lock and a mortise lock? 6.Can you tell us the history of our pieces? 7.How do we measure registers? 8.Can I salvage my original finish on my furniture? 9.How do I make a new mirror look "antique"? 10.How do we Remove a Musty Smell? 11.How do we Remove Ink or Black Spots & Rings From Furniture? 12.How do we Remove Water Marks? 13.How do we Repair a Roll Top Door? 14.What is a Good Way to Strip Furniture? 15.How do we Care For Wicker? 16.How do we "Antique" New Brass? 17.How do we Repair Picture Frames? 18.What Should We Do To Clean Our Hardware? 19.Converting a wardrobe to an entertainment center? 20.How do we Remove Dent From Wood? 21.How do we Make Door Knobs into Dummy Knobs? 22.How Do We Avoid Dimples In a New Finish? 23.How do we Reverse the Direction Of Our Locks? 24.Should We Repair Or Replace Our Broken Lock? 25.How do we Install an Older Lock? 26.How do we Make a Buffing Wheel to Polish Brass? 27.How do we Fix a Sticky Door? 28.How do we Straighten a Warped Board? 29.How do we Use an Old Lock in a New Pre-Drilled Door? 30.How do we Extend Bed Rails to Use a Modern size Mattress? 31.What is a good Furniture Finish To Use? 32.What type of Furniture Polishes Should be Avoided if you have a laquered finish or may someday refinish? 33.How do I fix Loose Veneer? 34.Is it Steel or Iron? No. Unfortunately we never will because by the time we could have it published and shipped out it would be outdated. The Internet is perfect for our business. We update new arrivals on drawer pulls and other items every 10 to 15 days. If you follow the new arrivals and watch the pulls, you can keep up to date. No. I would love to, but we are still waiting for longer days or less work to keep us busy so that we have more time. 3.I have an antique that is missing a part Can you match it for me? The rim lock is a surface mount lock - the entire lock can be seen because it is mounted on the surface of the door. A mortise lock is mounted inside the door and the lock itself cannot be seen. A mortise lock is accompanied by trim which is mounted on the surface of the door. Trim can be plates, rosettes and key escutcheons, and it can be made out of many materials such as bronze, brass, iron, steel, wood, & even porcelain or gutta percha. Yes!, it can be refinished without destroying the original finish. Use waterless hand cleaner such as "GoJo" original formula, "Orange", "Permatex", etc. - (make sure you get the stuff without pumice or grit of any kind) and #0000 steel wool if needed. Gently rub the wood in the direction of the grain with the steel wool generously coated with the cleaner. Wipe off with rags USE NO WATER!!!!. Be careful you don't scrub too hard or you'll remove the original finish. If the finish is already gone you may be able to touch it up after you're done cleaning it with a shellac finish to coat the missing spots or Reliable Finishing Products makes a great finish (VS, VINYL SEAL) that seems to go on over anything (most old finish) and dries super fast. (call Reliable 847-228-7667 for nearest re-seller), many antique dealers also know where to find this. The alligatoring that may still show is where the heat from sunlight through a window has bubbled up the finish, don't worry it will smooth out as you clean it and virtually disappear. I have cleaned antiques from as far back as the 1650s and the original finish is just fine, the alligatoring is now faint lines in the original finish that you can hardly see. Some people ignorant of salvaging original finishes will tell you to strip it off but the method we are giving you is worth thousands of dollars in salvage of original finish. 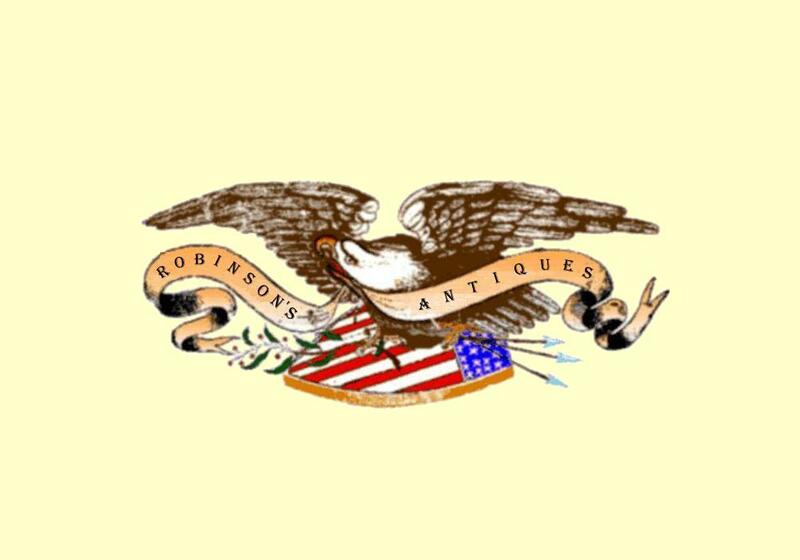 (You can leave me in your will or just send thank you donations to Steve at Robinsons Antiques.) Not only will your piece be more valuable without stripping off the original finish but this way is faster & cheaper, it's much easier on your hands and your wallet plus when you're done go add water to your hands and they clean right up too. To make a mirror look distressed: Take the mirror out of the frame use paint stripper and take off all the paint where you want it distressed. Be careful not to scratch the silver underneath, use a soft brush. If you have access to a small amount of nitric acid (app. a thimble full is enough to make it look pretty bad) (check chemical supply houses or labs to find this, you may be able to get a small amount from a school or lab) spatter the back or dab with a tooth pick where you want the spots to be. Be very careful to only get the tiniest speckles on the silver because this will destroy the silver immediately! Keep water handy to neutralize, wear gloves, respirator and have a ventilation fan in the area you're working in. If you cant find nitric acid Murata acid may work but not as fast or as well. After you're done rinse well, let dry, repaint. Put back in frame carefully so you don't scratch it (most scratches look bad & unnatural) unless you want to scratch through the silver to intentionally distress it but the acid treatment appears more natural. Sunlight and fresh air work, lay it out in the sun all drawers exposed to the sun as much as possible. The smell is from mold that survives better in dark closed spaces. There are also some other natural "possibly quicker" alternatives. I have found 3 natural ingredients that kill mold: tea tree oil (an essential oil found in most health food stores), grapefruit seed extract, and vinegar. There are pros and cons of each, but all three work. Vinegar is by far the cheapest. Tea tree oil is expensive, but it is a broad spectrum fungicide and seems to kill all the mold families it contacts. The problem is that it has a very strong smell, but that dissipates in a few days. Grapefruit seed extract is also expensive, but has no smell. See below for how to use these three ingredients in your home, to kill mold and mildew. Mold can be dangerous to your health, even if you aren't allergic. Many people react to mold by getting tired and even depressed. Try to stay on top of moisture and mold as soon as either arises. Dry out anything that is damp, such as basements (use a dehumidifier), and carpets. Fix leaks in plumbing and roofs. Wipe up spills. Make sure water doesn't escape from shower curtains. Vigilance will pay off! * Tea Tree Treasure Nothing natural works for mold and mildew as well as this spray. I've used it successfully on a moldy ceiling from a leaking roof, on a musty bureau, a musty rug, and a moldy shower curtain. Tea tree oil is expensive, but a little goes a very long way. Note that the smell of tea tree oil is very strong, but it will dissipate in a few days. 2 teaspoons tea tree oil 2 cups water Combine in a spray bottle, shake to blend, and spray on problem areas. Do not rinse. Makes 2 cups Preparation Time: Under a minute Shelf Life: Indefinite Storage: Leave in the spray bottle * Citrus Seed Extract The advantage of using citrus seed extract instead of tea tree oil for killing mold is that it is odorless. 20 drops citrus seed extract 2 cups water Combine in a spray bottle, shake to blend, and spray on problem areas. Do not rinse. Makes 2 cups Preparation Time: A minute or so Shelf Life: Indefinite Storage: Leave in the spray bottle * Vinegar Spray Straight vinegar reportedly kills 82 percent of mold. Pour some white distilled vinegar straight into a spray bottle, spray on the moldy area, and let set without rinsing if you can put up with the smell. It will dissipate in a few hours. 11. How do we Remove Ink or Black Spots & Rings From Furniture? 12. How do we Remove Water Marks? The Removal of White Heat or Water Marks Heat or watermarks that show up as white patches usually in laquered finishes after 1920. Laquer is very porous and lets silicone from polishes such as pledge through also it lets water through. Let's start with where they come from. When excessive heat is applied to most polishes some of the components of a polish might boil, creating tiny gas bubbles which upon cooling become tiny holes. Also when water and other liquids are left for a long time on the surface of the furniture it will penetrate part of this polish, swelling the thickness of it and then when those liquids evaporate tiny holes are left behind in the polish. Light entering such a hole is scattered in all directions and creates all colors of the rainbow, which combine as white to our eyes. In order to remove these white mark(s) we have to remove the tiny holes, so light may enter and leave the polish without this refraction. For most polishes this is done by filling the holes, or by softening of the polish to allow welding of the existing polish and thereby removing the holes. This process may be shortened by light sanding of the area to be treated, thus giving easier access to those microscopic holes, with fine sandpaper say 400 grid wet & dry or dry lube sandpaper, taking care not to remove any color or going down to the wood, as this will change the color of the finish. After such a mark is removed the whole table top should be repolished lightly along the direction of the wood grain, in order to have the same gloss all over the surface. If the piece was previously finished with lacquer, (typically pieces made between 1920-1950), great care should be taken not to dissolve too much of the old polish, I've heard of people using cigarrette ashes as a polishing compound but an auto polish (usually containing cerium oxide) is good. Rub until the marks have disappeared. When a piece is finished with a two pack polyester finish, typically Italian veneered pieces and piano's made after 1955, or many currently made pieces with printed grain, inlay or other images, a differing approach is needed, as this type of polish will not dissolve. Therefore light sanding is required preferably with wet & dry paper of about 400 grid using water or mineral turpentine as the lubricant, taking great care not to remove the coloring as this would necessitate recoloring before refinishing. This method will allow the lubricant to fill up the microscopic holes as soon as access is reached thereby negating the white reflection of the marked area. As soon as the white has disappeared we can stop sanding and allow the area to dry for one or two days, during which time the mark may reappear this however does not matter as access to the mark has been tested. After this thorough drying thinned out french polish can be applied making sure to keep rubbing until the polish is dry and no white spots are left buried under the new polish without being filled. If on next day some white reappears than severe rubbing is required with some very thinned out french polish or methylated spirits and a little oil until the marks have disappeared again, check the next day and if the white spots don't reappear then the polishing can be finished by recoating the whole area with the appropriate polish. After which the whole can be finished with a good wax. 13. How do we Repair a Roll Top Door? The old fabric was likely glued on with a hyde glue. If the old is loose peel it off then glue down a new piece of heavy unbleached muslin or a white canvas material. If the slats are spreading in spots you may have to re-arrange them to the original order they were in or clamp them lightly with bar clamps. (do this before adding glue to get the correct position) The new glue will re-activate the leftover glue on the wood (Spread with a board). Put a sheet of plywood on it then weight it some. After the glue has had a chance to stick but before it is totally dry (20-30 minutes for most carpenter glues or Elmers), roll the door up then lay it back out flat then put the weight back on. If you have any questions before you start, feel free to email or call. Essentially the lead paint is probably no more dangerous than the paint stripper is, none is good for you. Use rubber gloves with plenty of ventilation. 1. The best paint remover I have ever used is called 1776 by Reliable (847-228-7667 call for nearest re-seller), many antique dealers also know where to find this. 2. Keep it wet with your stripper, try not to let it dry out until the paint is all loosened up and removed. You can use a 1-1-1/2" bristled nylon brush to free up paint stuck down in any open grained wood such as oak. When it looks like all is loose using steel wool wet with stripper is good ~ and a dry piece to rub off a spot until it is dry (work small areas at a time 1-2 square feet at a time. Did I say Keep it wet! until you're ready to dry it off with the steel wool. 3. You can use another solvent to "clean up" the area from the stripper. Shellac thinner is good as most varnish finishes were shellac before the paint went on. Lacquer thinner works excellent (the best if you can use it) but you need very good ventilation for that. It dries fast. 15. How Do We Care For Wicker? Care For Wicker: Much depends on what kind of "wicker": 1. Is it genuine wicker? reeds, grasses, in other words is it natural materials? most of that is ok to get wet or damp. If it's man made material (paper wicker) I would not leave it in the rain. 2. On any "wicker" paint will protect it from the elements except where it start to crack water can get in and rot or let it get moldy. Natural Rushes and reeds are like wood they need to breath and paint clogs that up somewhat. 3. Never let man made paper wicker go unpainted if you want it to last outside. 4. On the good side even if your set gets/has problems wicker is very easy to repair, cutting out bad and replacing with new material is simple if you can weave in and out and glue down loose ends. 16. How do we "Antique" New Brass? Antiquing new brass You can easily "antique" new or over polished hardware or they will tarnish over time. A quick inexpensive method to get an instant "Antiqued" look is either to use "antiquing solution" (this may be a solution like a "gun blue") or spray paint them dark brown or black, then wipe off the highlights with a rag dampened with paint thinner (this 2nd way is fast and easy to do) You can also just buy our stuff! it is already old and much better quality than the new stuff. 17. How do we Repair Picture Frames? Use play doe or modeling clay to �copy� missing parts needed for a mold. Next, you can use plaster of paris or water putty but I like to use Bondo to spoon into the mold. Bondo is much easier to work with. You can either place the whole thing right in place now before it hardens, or wait for about 10-15 minutes and take it out while it's still soft then cut with scissors to exact shape and attach with a small amount of Bondo. You can also wait until it completely hardens and file and sand it to the proper shape. Let it dry and file/sand to shape then attach to the frame, paint or stain it to blend in. Tape it down or clamp it to the frame if needed. Bondo used to attach it will fill cracks between old and new parts. Also this same method can be used for duplicating or repairing wooden carved pulls. If you have any questions feel free to ask. 18. What Should We Do To Clean Our Hardware? Cleaning Hardware First determine the metal. The fastest and easiest way is to put a magnet to the item. If it does not stick, the metal is non-ferrous (brass, bronze, etc.). If it sticks, the metal is iron or steel. A lot depends on what you want to end up with, super bright or just cleaned a little. Brass and Steel: 1. If it has paint and gunk on it, strip it off using paint remover or lye. Brush if needed with a nylon bristled brush (tooth brush or larger scrub brush). This may be enough to get it looking good? Want it a little cleaner? Brass: 2. use some GoJo (original formula without pumice) hand cleaner and a nylon brush, wipe dry. You can also use oil of any kind. Want it a little cleaner still? Buff lightly with jewelers rough, highlights only on a buffing wheel (cloth pad spinning on motor) Or use brass polish until happy Want it a little cleaner still? Buff more with jewelers rough, highlights only on a buffing wheel until it gleams. Spray on a clear acrylic finish to keep it bright, or re-polish as needed. Iron: 2. Brush lightly with soft steel brush. Want it a little cleaner still? Buff lightly on wire wheel with a soft steel brush, until happy. Either spray on a clear acrylic finish or oil it to keep it bright or paint it the desired color. 19. Converting a wardrobe to an entertainment center? Don't drill holes, instead push the back away from the shelfs enough to get the wire through (make a new "extension cord" to come into it, you can then attach the ends after the wire is through). That way if you find something better down the road you have not hurt your investement. 20. How do we Remove Dent From Wood? 21. How do we Make Door Knobs into Dummy Knobs? Dummy Knob Spindles can be made easily by using a "hanger bolt" (wood screw on one side and threaded for a nut on the other). Grind the metal thread side square to fit into your knob. This is where you can determine the length left for the wood screw side so it does not go all the way through. Mark the spot where a set screw should be, drill and tap for the set screw and fasten together. You can then easily screw it right into your door. 22. How Do We Avoid Dimples In a New Finish? 23. How do we Reverse the Direction Of Our Locks? Most locks are reversible, you open the lock and in most cases simply flip over the striker. 24. Should We Repair Or Replace Our Broken Lock? 25. How do we Install an Older Lock? We're going to have to rely on your abilities, & a little. All you should have to do is: Draw a line down the center edge of the door, mark for the face plate & the lock body and drill out the door just deep enough for the height & width of the lock body. then chisel out the sides so the lock fits in. Chisel out shallow for the face-plate to seat flush with the edge of the door. If this sounds like too much, get someone like a contractor or carpenter to help you. 26. How do we Make a Buffing Wheel to Polish Brass? The easiest way to polish many brass/copper pieces fast is to use a buffing (polishing) wheel. A buffing wheel is a cotton wheel that spins on an electric motor. If you do not have one do you have a friend, father, brother/sister that does? You can make one up using any electric motor. An old washing machine motor, (may be found at yard sales for +/- $1) Then you'll need an arbor to hold the buffing pad (avg. cost +/- $4), buffing compound ("jewelers rouge" recommended avg. cost +/- $6) Start the wheel, add some rouge with the wheel turning toward you, lightly, hold the hardware up to the wheel at the lower side and let it shine. Be careful as the wheel can "rip it" out of your hand, don't have your fingers inside it if that happens. 27. How do we Fix a Sticky Door? "Sticky" might mean the case is cocked a little, experiment with lifting one leg. then another with a shim. If nothing else take a little wood off where it's sticking. Also check the hinges, if one is loose that could be the problem. 28. How do we Straighten a Warped Board? Take it out find a nice flat spot to lay your board out. lay wet rags on it, cover with a flat board 3/4 plywood is good and weight it or clamp it down. Weight it with something heavy (park the car on it overnight). You can also put a 2X4 frame work on the back and use a car jack on it with a 2X4 to the ceiling. After you see it has flattened out, remove the wet and weight it again to dry. 29. How do we Use an Old Lock in a New Pre-Drilled Door? You may not be able to use old hardware with pre-drilled doors without some modification. If you have the big round hole, you can plug the hole in the face with wood, then re-drill for the old set. Older roses (round backplates) are an average of 2". If the door is painted just putty and paint over it. If it's finished wood, putty any cracks, and find a ring to fit around the hole to use as a guide so you don't over spray (canning jar ring?). Spray a gold decorative ring to highlight your new old roses. If the older set has the rectangular backplates, they may be wide enough to cover the hole. If you need to plug the hole and a small amount shows, simply mask off and paint a frame that will be �" - �" around your new old backplates to hide the plug. It sounds like a lot of trouble but not when you consider the quality and beauty of the older hardware. Our older hardware has been around +/- 100 years and is still in fine working condition while so many newer locksets wear out within only a few years. The "better" newer locksets may even last 15-25 years while the old ones will still be in use for another 200-300 years plus. 30. How do we Extend our bed rails so we can use a modern size mattress? What you would need to do is make a short bedrail with a hook on one end and a receiver on the other that match your old rail hardware. Here is a link to the bedrail hooks so you may locate the type of hook your bed has: Bed Hooks If you do not see your hook, please send a picture with measurements. If have any further questions feel free to ask. 31. What is a good final finish to use? 32. What the worst type of polish to use? Pledge, Endust, etc. feel really great when you put them on. What is bad is: if you ever want to refinish the piece, then they are not such good polishes as they have silicone in them. Silicone will go though lacquer and many other finishes and lodge permanently in the wood. (See #22 on Fish Eyes) Silicone repels finish and in the event you ever need to touch up or refinish it can cause "fish eyes" (little dimples in the finish where silicone is rejecting the finish). It is impossible to completely remove this without destroying your furniture as it goes deep into the pores. 33. How do I fix Loose Veneer? First glue down any & loose venner before you put any cleaner or stripper on it! Search for loose veneer with your fingernails. Tap on it, listen to the sound. Where it is tight it has a strong sound. Where it is loose it will have a "hollow sound". It won't take long before you figure out the difference if you do have any loose veneer. Check especially around the edges. Get your supplies around first, glue, clamps, wood blocks for under the clamps, wax paper, wet rag. Many old pieces used a hyde glue that when it gets wet it will re-activate it so make sure you slip glue in deep to help wet it and tack down all the loose venneer. If it is bubbled up with no loose ends, split it with a razor blade to get glue in. With a long blade or narrow putty knife, carefully lift the loose veneer and slip glue in on all sides of the split. Work it in well, don't worry if it oozes out all over (that's what the wet rag is for) . Use wax paper under the blocks when you clamp it (keeps the blocks from sticking) . Take it apart after 10 - 15 minutes wipe it off good, dry it and re-clamp. Let it dry. When you take off the clamps the next day it should be ok, but if there is a bit of stray glue, scrape it off now. This is all best to do before cleaning or stripping as any liquid that gets under the veneer could further loosen any veneer that is already a little bit loose. 34. Is it Iron or Steel? Steel and iron are sometimes interchanged. Iron is usually used as in "cast iron". Steel is often used as in "sheet steel". Bails are Steel, Registers are Cast Iron. Iron is a general word used to describe metals that have pure iron as their main constituent. Most iron wares around us are not made of chemically pure iron but are alloys, the most important of which is Carbon. Carbon is a big factor in understanding the difference between Iron, Steel and Cast iron. Adding some carbon to chemically pure iron makes steel. Add even more and you'll make cast iron Iron ~ Technically, iron means just that, chemically pure iron. Without carbon, iron is very soft and ductile. Iron become softer upon heating. So a smith can change its shape by hammering but it can never be hardened by heat treatment. Steel ~ Steel is an alloy of iron and carbon. The amount of carbon dictates whether a steel is hard or it is tough. Adding Carbon makes the iron harder. The more carbon the harder the steel. Carbon content in steel usually falls a range between 0.3 ~ 1.5 % by volume. Iron /carbon alloys within this range are called steels. Steels can be forged and hardened by heat treatment. The high carbon steel is harder than the low carbon steel. Because carbon content is critical to hardening, the effect of heat treatment is big on high carbon steel, and small on low carbon steels. In other words, high carbon steels are more sensitive to tempering work. High carbon steels undergo structural changes when heated and cooled rapidly making them useful for items that require degrees of hardness. High carbon steels appear some different phases that come from the difference of the situation in tempering work. The result of relation between sensitive steel and good tempering work makes subtle appearances on a blades surface. Cast Iron Carbon content over 1.5 % make iron alloys brittle, non-ductile and unable be worked by hammering. Also these alloys can't be hardened by heat treatment. Such metals are easy to melt, and easy to break by hammering. Therefore they are used only for casting work. Therefore we can see that iron, steel, and cast iron form a family based on the absence or degree of carbon content. Any other questions? Feel free to ask. If you have any further questions about antique hardware or furniture repair please contact us (616-374-7750 or e-mail).